How would you feel about a book about a singular subject - cornbread? I was a bit hesitant when I first found out about the Cornbread Gospels, written by a woman with a most improbable name of Crescent Dragonwagon. But as soon as I heard it, I also thought "cornbread? Oh, but I love cornbread!" and thus, I agreed to review the book. And boy, am I ever glad I did. Wait, did I say glad? That doesn't describe my feelings accurately. At all. Because this book? This book is just.. oh, it's definitely the first single-subject cookbook I've been enthused by to this degree, and it's the first book in ages that's really prompted me to get into the kitchen N O W!! And in fact, it also sent me scrambling to buy a decent cast-iron skillet, because I didn't have one. The one thing that bothers me is that I can't get decent corn meal here. I can get polenta, and that's it. White corn meal? Blue?? Stone-milled??? Forget it. Polenta is what I've got, and it's what I'll use. I guess I could try to find a place that ships to Sweden, but I'm betting the post office would charge an arm and maybe also a leg to get it here, so for now, polenta it is. The first recipe to try was Crescent's very own from Dairy Hollow House where this was served for many years. Since it's also on her own website - the Cornbread Gospels - I don't feel bad about writing it out here, too. (Click here for the original and her instructions. 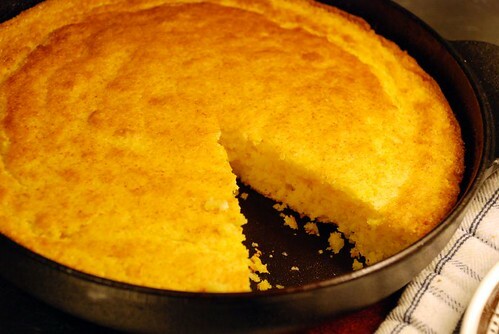 )If you're only going to try one cornbread, try this one. You won't regret it. I have to admit that I was hesitant about the whole baking-in-a-skillet thing. Deep inside, I felt that it surely wouldn't work, but stick to the pan and never ever come out. I was wrong. And when I lifted out that heavy skillet (really, really heavy by the way) filled with glorious golden cornbread, it really delighted my inner domestic goddess. And when I ate it, I felt even better. Oh. And you might want to put that book on your wishlist. Really. It's excellent. You need a cast iron skillet, about 25 cm in diameter. Mix cornmeal, flour, baking powder and salt in a bowl. Whisk the buttermilk (or filmjolk) with baking soda, sugar, egg and oil in another bowl. Heat the skillet on the stove, and melt the butter. When the butter sizzles, quickly add the wet ingredients to the dry ones and combine with as few strokes as possible. Pour into the hot skillet and place it in the oven to bake for 20-25 minutes, until golden. Thanks for this post. I can't wait to get my hands on a copy of this. I am a southern girl & love cornbread of all kinds. Crescent Dragonwagon - what a brilliant name. I just made some cornbread last night and was left thinking that I needed a bit more cornbread in my life - perfect timing ! Hopefully I will be in Stockholm in the spring. My boyfriend is based partially there . If so I will let you know, and mail it (cormneal) from there if you'd like? Courtney, that is really so sweet of you! Do let me know if you come here - I'd love to meet up for coffee, too! Maybe you have a suggestion for a few kilos of leftover polenta? Har du prövat Grey's American Foodstore eller the English Shop? Brukar finnas massa icke-svenska ingredienser där. Tror att de säljer online också, men inte säker. Lycka till! I absolutely love this cookbook as well. A friend just gave me a copy yesterday as a present. The way he found out about the book was when I borrowed a copy from the local public libary and let him look it over. I made the Dairy Hollow House Skillet Sizzled Cornbread last night and served it with some spicy celeriac soup and cilantro. I brought a piece of the cornbread in to work to let my gift giver try it. He agreed it was fabulous. I live in Madison Wisconsin and we are very fortunate to have lots of choices of cornmeal. I want to try the recipe for Truman Capote's Family's Cornbread which calls for stone-ground white cornmeal. I'm going to have to check around to see if I can find it locally. Hey, I'm about to review that book too. Have been making recipes from it all week. It's great. And must say your cornbread looks amazing, if all you could get is Polenta! If you want to do some kind of trade (I'll send you some stone-ground cornmeal and you send me something yummy and Swedish of about the same weight), drop me a line! ps if you have leftover dairy hollow house cornbread, the apricot-lemon bread pudding in the desserts chapter is amazing! I LOVE the internet, looking up cornbread, finding you, based in Sweden, talking about an American book, which I just ordered from the UK to me in Australia! Thank you - I will be visiting your page more often!